This paper proposes a fast method for detecting tomato peduncles by a harvesting robot. The main objective of this study is to develop automated harvesting with a robot. 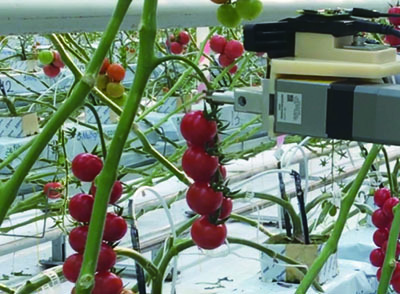 The harvesting robot is equipped with an RGB-D camera to detect peduncles, and an end effector to harvest tomatoes. It is necessary for robots to detect where to cut a plant for harvesting. The proposed method detects peduncles using a point cloud created by the RGB-D camera. Pre-processing is performed with voxelization in two resolutions to reduce the computational time needed to calculate the positional relationship between voxels. Finally, an energy function is defined based on three conditions of a peduncle, and this function is minimized to identify the cutting point on each peduncle. To experimentally demonstrate the effectiveness of our approach, a robot was used to identify the peduncles of target tomato plants and harvest the tomatoes at a real farm. Using the proposed method, the harvesting robot achieved peduncle detection of the tomatoes, and harvested tomatoes successfully by cutting the peduncles. T. Yoshida, T. Fukao, and T. Hasegawa, “Fast Detection of Tomato Peduncle Using Point Cloud with a Harvesting Robot,” J. Robot. Mechatron., Vol.30, No.2, pp. 180-186, 2018. N. Irie, N. Taguchi, T. Horie, and T. Ishimatsu, “Development of Asparagus Harvester Coordinated with 3-d Vision Sensor,” J. Robot. Mechatron., Vol.21, No.5, pp. 583-589, 2009. S. Bachche and K. Oka, “Design, Modeling and Performance Testing of End-Effector for Sweet Pepper Harvesting Robot Hand,” J. Robot. Mechatron., Vol.25, No.4, pp. 705-717, 2013. N. Kondo and M. Monta, “Fruit Harvesting Robotics,” J. Robot. Mechatron., Vol.11, No.4, pp. 321-268, 1999. X. Chen, K. Chaudhary, Y. Tanaka, K. Nagahama, H. Yaguchi, K. Okada, and M. Inaba, “Reasoning-Based Vision Recognition for Agricultural Humanoid Robot Toward Tomato Harvesting,” 2015 IEEE/RSJ Int. Conf. on Intelligent Robots and Systems (IROS), pp. 6487-6494, 2015. H. Yaguchi, K. Nagahama, T. Hasegawa, and M. Inaba, “Development of an Autonomous Tomato Harvesting Robot with Rotational Plucking Gripper,” 2016 IEEE/RSJ Int. Conf. on Intelligent Robots and Systems (IROS), pp. 652-657, 2016. S. Hayashi, K. Shigematsu, S. Yamamoto, K. Kobayashi, Y. Kohno, J. Kamata, and M. Kurita, “Evaluation of a Strawberry-Harvesting Robot in a Field Test,” Biosystems Engineering, Vol.105, No.2, pp. 160-171, 2010. S. Hayashi, K. Takahashi, S. Yamamoto, S. Saito, and T. Komeda, “Gentle Handling of Strawberries Using a Suction Device,” Biosystems Engineering, Vol.109, No.4, pp 348-356, 2011. Y. Tokunaga, T. Hakukawa, and T. Inoue, “Algorithm and Design of an Intelligent Digital Integrated Circuit for a Watermelon Harvesting Robot,” J. Robot. Mechatron., Vol.11, No.3, pp. 173-182, 1999. S. Yongsheng, L. Gang, and F. Juan, “Location of Apples in Trees Using Stereoscopic Vision,” Computers and Electronics in Agriculture, Vol.112 (Supplement C), pp. 68-74, 2015. S. Arima and N. Kondo, “Cucumber Harvesting Robot and Plant Training System,” J. Robot. Mechatron., Vol.11, No.3, pp. 208-212, 1999. M. Monta, N. Kondo, S. Arima, and K. Namba, “Robotic Vision for Bioproduction Systems,” J. Robot. Mechatron., Vol.15, No.3, pp. 341-348, 2003. E. J. van Henten, J. Hemming, B. A. J. van Tuijl, J. G. Kornet, J. Meuleman, J. Bontsema, and E. A. van Os, “An Autonomous Robot for Harvesting Cucumbers in Greenhouses,” Autonomous Robots, Vol.13, No.3, pp. 241-258, 2002. E. J. Van Henten, B. A. J. Van Tuijl, J. Hemming, J. G. Kornet, J. Bontsema, and E. A. Van Os, “Field Test of an Autonomous Cucumber Picking Robot,” Biosystems Engineering, Vol.86, No.3, pp. 305-313, 2003. E. J. Van Henten, B. A. J. Van Tuijl, G.-J. Hoogakker, M. J. Van Der Weerd, J. Hemming, J. G. Kornet, and J. Bontsema, “An Autonomous Robot for De-leafing Cucumber Plants grown in a High-wire Cultivation System,” Biosystems Engineering, Vol.94, No.3, pp. 317-323, 2006. I. Sa, C. Lehnert, A. English, C. McCool, F. Dayoub, B. Upcroft, and T. Perez, “Peduncle Detection of Sweet Pepper for Autonomous Crop Harvesting – Combined Color and 3-D Information,” IEEE Robotics and Automation Letters, Vol.2, No.2, pp. 765-772, 2017. R. A. Newcombe, S. Izadi, O. Hilliges, D. Molyneaux, D. Kim, A. J. Davison, P. Kohi, J. Shotton, S. Hodges, and A. Fitzgibbon, “Kinect fusion: Real-Time Dense Surface Mapping and Tracking,” 2011 10th IEEE Int. Symposium on Mixed and Augmented Reality, pp. 127-136, 2011. R. B. Rusu, N. Blodow, and M. Beetz, “Fast Point Feature Histograms (FPFH) for 3D Registration,” 2009 IEEE Int. Conf. on Robotics and Automation, pp. 3212-3217, 2009. L. Luo, Y. Tang, X. Zou, M. Ye, W. Feng, and G. Li, “Vision-Based Extraction of Spatial Information in Grape Clusters for Harvesting Robots,” Biosystems Engineering, Vol.151, pp. 90-104, 2016. C. Chang and C. Lin, “LIBSVM: A Library for Support Vector Machines,” ACM Trans. on Intelligent Systems and Technology, Vol.2, No.3, pp. 1-27, 2011.